Hey, how about a brief evaluation of the program so far. You've completed five lessons. You're getting familiar with the approach. What's your take on it at this point? I like it. It's okay. I don't like it. ...results in both variables being incremented and both winding up with a value of 2. But that isn't the case. Only the original variable, num, gets incremented. The new variable, newNum, gets shortchanged. It winds up with the original variable's value of 1. Strangely, the ++ doesn't apply to it. It works the same way with minuses. To prove to yourself that the plusses actually work as I say they do, run the code (click the Run button) at my demonstration on JSFiddle. Code a short form of x = x + 1; Use either of the two legal expressions. If x has a value of 100, what is the fastest way to reduce it to 99 with a math expression? Use either of the two legal expressions. Using minimal code, decrement x. Use either of the two legal expressions. In a single statement subtract 1 from a variable and assign the new value to another variable, which hasn't been declared beforehand. Both variables wind up with the same value. Increment a variable. Use either of the two legal expressions. In a second statement, display its new value in an alert. Time goal: 15 seconds. Using minimal code, decrement x. Use either of the two legal expressions. Time goal: 25 seconds. In a single statement subtract 1 from a variable and assign the new value to another variable, which hasn't been declared beforehand. Both variables wind up with the same value. Time goal: 25 seconds. Increment a variable, then display its new value in an alert. Use either of the two legal expressions. Increment the variable using minimal code. Use either of the two legal expressions. 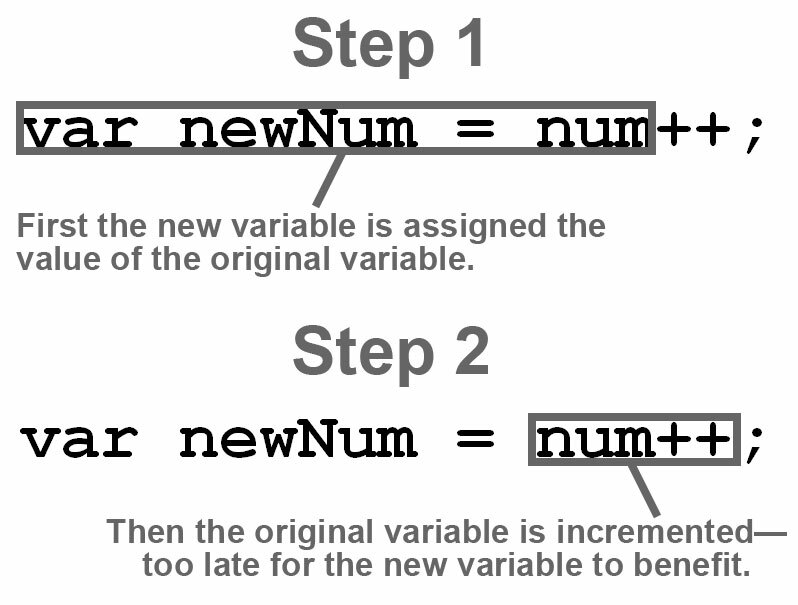 Increment the variable using minimal code while assigning its incremented value to a second variable. Both variables wind up with the same value.